Visual Design vs UX: What Overlaps and What Doesn't - Guiseppe Getto, Ph.D.Guiseppe Getto, Ph.D. I recently gave a presentation for the Write Now! 2015 Triangle Area Freelancers Annual Writers’ Conference with Rick Evans of RoleModel Software about visual design vs UX. Our main argument was: sometimes they overlap and sometimes they don’t. One of the most common questions I get whenever I present on UX at any venue that doesn’t feature a room full of UX experts is: what’s the difference between UX and visual design? Another way of putting this is: doesn’t good visual design = good UX? 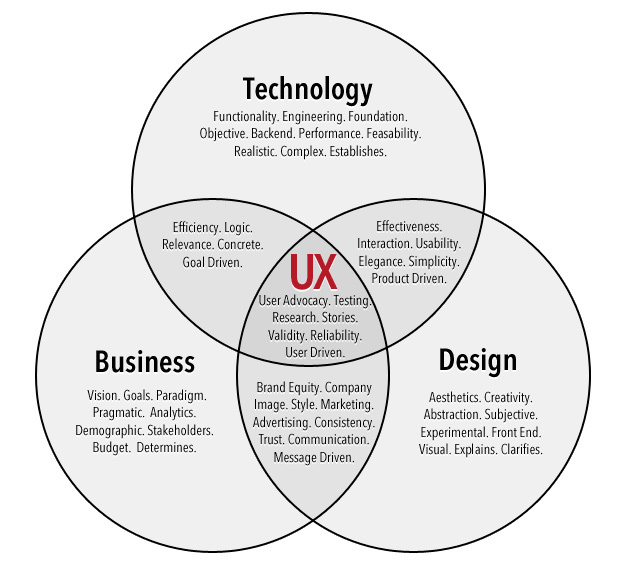 The great thing about this infographic, is that it shows all the parts of UX I can think of, and clearly puts design in its place. When most people think of the word “design,” in other words, they think of the visual. They think of aesthetics and making stuff look a certain way. This may seem like an old argument for UXers, but I think it still matters, because as long as design carries these connotations, it’s going to be difficult for clients, students, and practitioners new to UX to distinguish the visual from the entire UX spectrum. What’s also great about this infographic, is that it doesn’t make the visual synonymous with design. The visual is just one aspect of design, but design is about more than just the visual. It’s about experimentation and trying to make stuff make sense for an audience. So, my answer to this question is always: of course. Of course the visual always matters. The web is a visual medium, after all. Even textual information on the web is rendered visually. And yes: if your website or app looks like something that was designed 20 years ago, of course that will negatively affect your organization. Aesthetics matter, in other words. Taste matters. But taste isn’t all that matters, and probably isn’t even the most important thing. As recent debates on the dribbblization of design have made clear: often taste can even get in the way of good design. I think my favorite thing that my co-presenter said to our audience, largely composed of freelance writers trying to launch or maintain their own websites on a shoestring, was: “UX is about solving problems.” This is an oft-echoed phrase in the UX community, but I think it’s the closest we have to a slogan, and for good reasons. Sometimes problems are visual. Sometimes they are informational. Sometimes they are promotional. Sometimes they are technological. Usually: they are about more than one of these things. You never know what the root of a problem is until you dig in and figure it out. So, the other part of design that isn’t just about taste, the part that is about making, experimentation, and trying out solutions, that’s what really matters. In my field, we call this type of thinking “heuristic.” If problems are too complicated to solve in a rote way, such as by applying simple visual best practices, then you have to try out different solutions. Sometimes there is no one solution, and you have to make the best of the situation by coming up with a solution that seems the most appropriate, given the information you have. Often, the solution is iterative, meaning it evolves over time as the problem evolves. In the design disciplines, this is often called “design thinking.” Whatever you call it, however: it is definitely about way more than just the way an application looks.